The aim of this study was to investigate the effects of castration on carcass characteristics and fatty acid profile of visceral fat and meat from lambs. Eighteen six-month-old Santa Inês male lambs (18.9 ± 2.4 kg of body weight (BW)) were used. Animals were assigned to two treatments according to their sexual condition: uncastrated (U) or castrated (C). 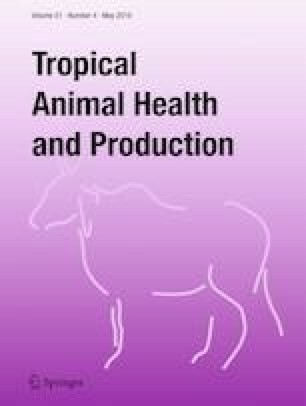 During a 98-day experimental period, animals were kept on an Andropogon gayanus grass pasture area of 1 ha and supplemented with 200 g/animal/day of concentrate mixture. Water and mineral salt were available ad libitum. The lambs were weighed fortnightly, and at the last day of the trial, they were slaughtered for evaluation of carcass characteristics and fatty acids profile of perirenal fat and longissimus lumborum muscle samples. Castrated lambs showed higher BW than U during most part of the experiment (p < 0.05). Fat deposition was higher in C lambs as evidenced by their increased carcass fat cover. Meat from U lambs showed lower content of C16:0 and higher polyunsaturated fatty acids (PUFA) (p < 0.05) than that from C (U, 14.3 and C, 10.5%). Conjugated linoleic acid (CLA) content was not affected by castration (p > 0.05) (U, 0.74 and C, 0.76%). The cis-9, cis-12 C18:2n-6 (U, 10.6 and C, 6.86%) fatty acid and the PUFA:SFA (saturated fatty acids) ratio (U, 0.36 and C, 0.25) were higher in the muscle of U lambs (p < 0.05), indicating that the meat from U animals may provide more benefits to human health than that of C.
This work received financial support from the Foundation for Scientific and Technological Enterprises - FINATEC and scholarships from the National Council for Scientific and Technological Development – CNPq. This experiment has been conducted in accordance with the Brazilian laws of ethics in animal experimentation.